Outset Israel supported Hilla Ben Ari’s installation “Rethinking Broken Lines – A Tribute to Heda Oren” exhibited in Herzliya Museum of Contemporary Art, curated by Tal Yahas. The video installation “Rethinking Broken Lines” by Hilla Ben Ari (born 1972), is based on the artist’s comprehensive research into the work of Israeli choreographer Heda Oren (1935–2008). It is the latest chapter in a series of tributes by Ben Ari, in which she engages in dialogue with the bodies of work produced by veteran Israeli artists in diverse artistic disciplines. Through this dialogue she draws out possible genealogies of proximity and difference, affinity and tension between genders and generations as expressed in the relationship between the feminine body and the locus of action. Heda Oren was born in Netanya and lived on Kibbutz Ashdot Yaakov from an early age until she died. She studied dance at L’École Supérieure d’Études Chorégraphiques in Paris, and took lessons with, among others, choreographers Murray Louis and Alwin Nikolais in New York. At the peak of her artistic career, from the 1970s to the mid-1980s, Oren was among the first choreographers to create dances for the Kibbutz Contemporary Dance Company; worked with the Batsheva 2 Dance Company; and created dances for the dancer Ruth Eshel. In 1975 she opened a center for dance studies in the Jordan Valley, which she headed for many years, and endeavored to establish an independent, professional dance company based in this region. Over the years she also created dances for her kibbutz’s holiday ceremonies, seeking to combine her artistic aspirations with her commitment to community life and to breathe new artistic life into Jewish traditions. Oren’s career was characterized by constant oscillation between center and periphery, as she struggled to make her place as a creator and develop professionally while living on a kibbutz. This movement reverberates in her works, too, in the constant tension of bodily presence that fluctuates between contraction and expansion, as well as in the tension between a search, on the one hand, for the “odd movement,” as she called it, informed by remoteness and lack of belonging, and, on the other, for foundation and anchoring. Her works are characterized by a formal exploration of movement that engages with the body’s autonomy and universal aspects. At the same time, however, they regard the body as planted within a particular cultural and social context that endows it with meaning, enabling yet constraining its movement. “Rethinking Broken Lines” offers a new look at Oren’s oeuvre as seen through the prism of the artistic practice developed by Ben Ari over the past years. Born on Kibbutz Yagur, Ben Ari’s works engage, through a visual exploration, with the presence of the feminine body in the collective space. She pursues questions of discipline and resistance in the relationship between the female body and the space that both gives it form and is formed by it. Ben Ari’s images in diverse media transpire between movement and stillness, placing the (mostly feminine) body in physical postures that are almost impossible to maintain. These postures demand from the body constant, superb effort, flexibility, containment, endurance, and balance, often involving pain and self injury. Her videos are looped, thereby capturing the body’s arrested pose in a never ending duration, exposing the relentlessness of the effort while manifesting ambivalence between compliance and defiance, virtuosity and torture. The video installation fuses together elements from the bodies of work produced by both Oren and Ben Ari. It is composed of several screenings scattered around the space, some of which are projected on papers fastened by metal constructions. The screened images show dancers holding postures extracted from Oren’s choreographies or inspired by them. Their screened, almost life-size bodies are supported by the constructions and assimilated into the two-dimensional fragility of the paper. Together, the postures and sounds make up a new spatial choreography that conjoins visual art and dance, with their different modes of composition and conditions of viewing. Moving around the space, the spectators assemble the subtle, fragmented movements performed by the dancers in the images strewn across the space. In doing so, their own presence becomes an additional element in the composition, altering it and conferring further meaning on it. 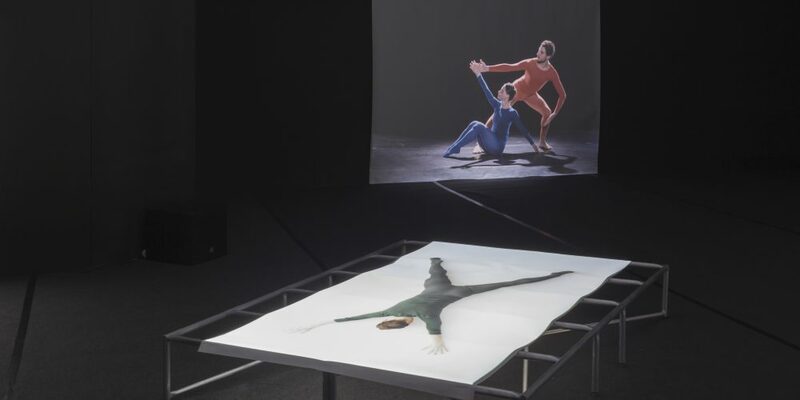 Hilla Ben Ari’s exhibition is accompanied by the archival display, “Heda Oren: ‘Everyday Movement, Under Which Conditions Does it Become Dance?’, “comprising items from the choreographer’s professional biography. The display includes photographs, videos, sketches, and diary pages documenting key moments in her forty year career.